This is a way to execute CSS selector against the specified html files. 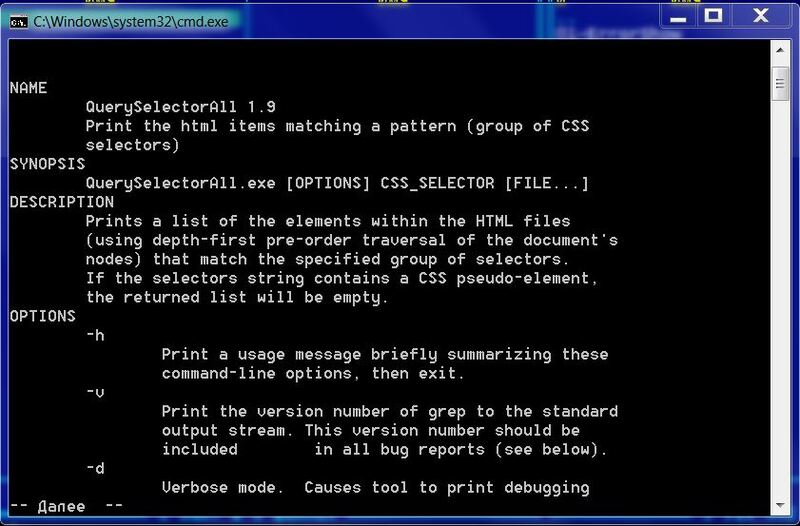 Prints a list of the elements within the HTML files	(using depth-first pre-order traversal of the document's nodes) that match the specified group of selectors. This is a way to execute CSS selector against the specified html files. Print the html items matching a pattern (group of CSS selectors). Usually there is stdout mode (0), but you can use other supported	modes such as: (1) Save only one output file	'_all.lst' with all the collected matches. (2) Save search matches from one file into new file, using filename the source file and predefined extension '.lst' as template to specify the target	file. (3) Save each item into eparated files (filename+counter+.lst). (4) Save each item into separated files (counter+.lst). (5) Make _index.lst an ordered list from A tags. Matched items will be cleaned on the strip_tags(), but (6) mode don't use it.